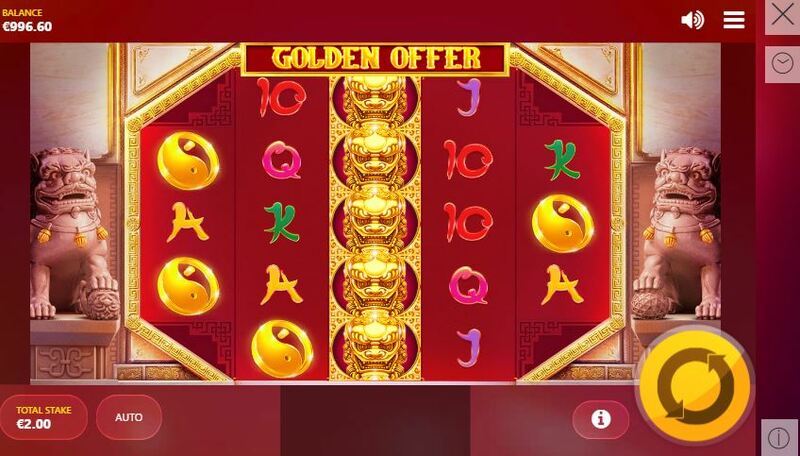 Golden Offer slot's theme is not the header for a spam e-mail or the latest flyer from you local superstore but another of Red Tiger's specialty - Oriental games. It joins several other titles on the same theme, which include Golden Lotus and Lion Dance. The reels are set in a temple guarded either side by a rather bored and puggish-looking pair of Lions, perhaps due to the stereotypical mandolin and cymbal Chinese music they are forced to endure throughout your gameplay. So will this Golden Offer be one you cannot refuse? The immediate oddity we see is the unusual formatting of the reels of which we have 5 as usual but in a 3-5-5-5-3 row pattern. This may appear to be a multi-way format but in fact there are 40 fixed paylines. The icons appear stacked including Wilds in the form of golden Balls on all reels offering the top pay of 20x bet for 5-of-a-kind followed by the golden Lions at 10x, the golden Ying Yang at 5x and the pearl at 2.4x bet for the 5. The card values are present too and offer 0.4 to 1.2x stake for the full 5. Special Reels - the spin will have only stacked picture symbols and Wilds on for that spin, increasing big-win possibilities. Wild Reels - a random number of reels containing only Wild symbols. Swap Tiles - the lower-paying ones in view will transform to higher-paying values. Lion's Nudge - the reels jiggle for a big win. 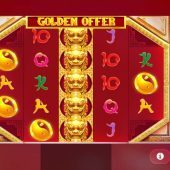 If you see 3 of the game's Golden Offer icons on reels 2, 3 and 4 you will see the background turn red and a random amount of offers available from 3 upwards. The Lions at the side will then turn gold and roar gold coins into the centre which form a win amount which counts up. You can accept it or refuse, so they do it over again, hopefully increasing your potential award. Once you use your offers you will be automatically given the last amount the Lions award. I found the first offer tends to be the best if you only start with 3, just a tip!